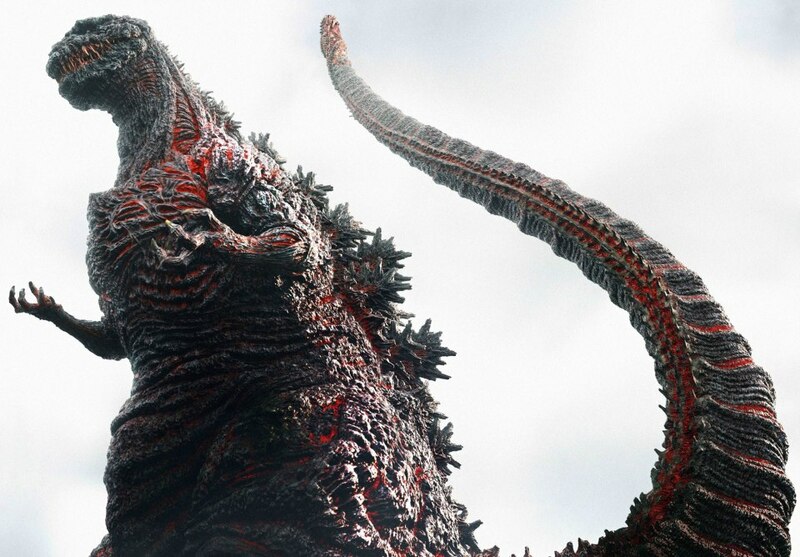 Godzilla was first conceived as personification of the destruction caused by the nuclear attack on Japan with an anti war message behind the whole thing. Though through other more child friendly interpretations and marketing gimmicks the king of the monsters has been made into a joke. Though there are limitations on how seriously the image of a man in a rubber suit as well as the concept of a giant lizard destroying a city can be taken there is no doubts that the first movie meant it to tackle serious subject matters. In 2014 we got the Hollywood version of Godzilla by Gareth Edwards, which is one of the most unhappy times I have ever had in a movie theatre. We hardly ever got to see Godzilla, the human characters were un-engaging and the image was so dark that hardly anything could be seen. Now for whatever reason Toho has decided to make their own movie. Reintroducing the character for a new audience. It opens on a day like any other, only this day there are movements coming from the sea, first just ripples, then things start poking out, eventually it moves into the city and nothing stops it. So now the people in-charge must make decisions on how to deal with this creature. Though we still live in a world where the threat of nuclear annihilation is possible, it’s not the prime concern. This movie’s focus is in dealing with a colossal threat that seemingly comes out of nowhere. It layers itself with seeing Godzilla on the move and the devastation he is raining down and the officials running around trying to understand the creature and make decisions. In the directing chair is Hideaki Anno, legendary anime director who will probably always be closely associated with Neon Genesis Evangelion (which also includes the earth dealing with giant monsters attacking them) one of the most legendary titles in anime. This is his first work in live action and he adapts well. He knows how to visually convey information with a few or even a single image. This design of Godzilla is probably the most threatening and horrifying version that’s ever been conceived. They stay true to the mentality of a man in a rubber suit, having his movements be slow and limited. His skin looks like glowing, burning scabs, tiny and focused eyes like that of a shark a mouth filled with razor sharp teeth. Along with the new look is also the classic powers that he’s known for and some new ones that are explained by adding something to the mythology. I wont tell you what it is but its a satisfying one that allows the legend to adapt and grow in this new time. Though the sharpness of special effects is not everything, not even the most important thing in movies it is still important. This is because if we don’t believe that monster, spacecraft, laser-blasts, castle are really there then we are taken out of the experience. The rendering of Godzilla is shoddy to be frank, especially in the early stages, other things like trains look rather fake too, however such things are forgiven if they are in a story and situation that has grabbed you. There are many human characters in the movie that all run around the rooms and spout their opinions and facts that are coming in. There are definitely over twenty characters that are introduced through a gauntlet of a passe. They talk very fast and their credentials pop on-screen at the same time, never stopping. There is a part in the movie where they all wake-up from working all night and decide to take a break and eat, then they reflect on how hard everyone has been working. This moment alone lets you connect and feel for these characters more than any complicated speech or feat of heroism. However I’d still be lying if I said you walked away really having gotten to know anyone. This is not the great reinvention of the character or the monster. But I have seen how bad a movie like this can get. It is not boring and the image is clear and the sense of panic and destruction are effective.